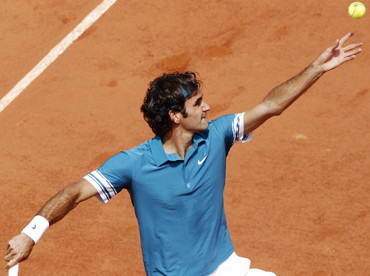 Roger Federer kept his game together through several rain interruptions and a stirring first-set charge from Colombian Alejandro Falla before booking a comfortable third-round berth at the French Open on Wednesday. Falla had lost just three points on his serve when a hold at 6-5 would have given him the first set, but Federer broke back and stormed through the tie-break on his way to a 7-6, 6-2, 6-4 victory on Court Philippe Chatrier. After a frustrating hour or so when two rain breaks ruined the momentum of the match, Federer upped his game and treated a crowd dominated by the excitable cheers of local schoolchildren to a feast of stroke-making as he came through in two hours. He will now play Belgium's Olivier Rochus or German qualifier Julian Reister for a place in the last 16. Federer, without a title since the Australian Open, managed just three points on Falla's serve and was broken himself at 5-5 before responding immediately to break back and win a tiebreak. Twice the players were forced off by rain that interrupted the schedule all day but Federer kept his game together and suffered no further alarms. Before sticking to the strict all-white dress code at Wimbledon next month, Venus Williams is indulging in some risqu French cancan in Paris. The American's black lace corset resembling an offcast from the nearby Moulin Rouge cabaret has been the talk of the French Open, and the accompanying tight skin-coloured knickers have raised just as many dumbstruck glares. The second seed's 6-2, 6-4 second-round win over Spain's Arantxa Parra Santonja was very much a secondary issue for many on Wednesday. "The design has nothing to do with the rear. It just so happens that I have a very well developed one," she chuckled during her post-match press conference. The opening Wednesday at Roland Garros is traditionally when Parisian schoolchildren are given priority for tickets, and they and their teachers almost got even more than they bargained for as the unconvincing red straps to Venus's dress threatened to reveal yet more of the American. The world number two wore the outfit for the first time at the Sony Ericsson Open in Miami earlier this year and she uses her daring court appearances to promote her own line of fashions. "It's really about the illusion. Like you can wear lace, but what's the point of wearing lace when there's just black under," she added. "The illusion of just having bare skin is definitely for me a lot more beautiful. So it's really not about anything else other than just that skin showing." Venus, who seems to prefer to talk fashion than tennis, believes her outfit is the symbol of her personality. "I try to represent what I think my personality is on the court. That's the first part of it," she said. "The second part is sometimes you just dream it up. Sometimes you can see a dress and say, 'Hey, I really like those slits, so let me put that in my tennis dress'." 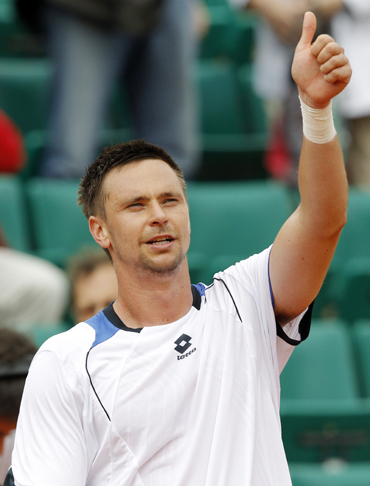 Sweden's Robin Soderling swept into the third round of the French Open on Wednesday, destroying American Taylor Dent for the loss of just two games. The 2009 runner-up needed just 71 minutes to post a 6-0, 6-1, 6-1 victory and set up a last-32 clash against either qualifier Tobias Kamke of Germany or Spain's 29th seed Albert Montanes. So far in the tournament the fifth seed has conceded just seven games after his first round defeat of Laurent Recouderc. Soderling, who stunned four-times champion Rafael Nadal last year and went on to lose to Roger Federer in the final, took the opening set in 17 minutes, dropping just five points. Dent finally registered on the scoreboard when he held serve early in the second set but he had no answer to the baseline power of Soderling who powered on to victory. 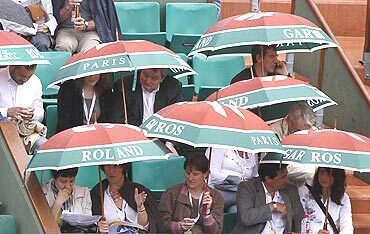 Meanwhile, rain stopped play at the French Open on Wednesday. Holder Roger Federer was 7-6 6-2 0-1 up in his second-round match against Colombia's Alejandro Falla on Court Philippe Chatrier when steady drizzle worsened and the tournament director ordered play to be halted for the second time at 1255GMT. Earlier women's second seed Venus Williams reached the third round with a straight sets win over Arantxa Parra Santonja of Spain. Showers are forecast throughout the day in Paris after three days of warm sunshine. 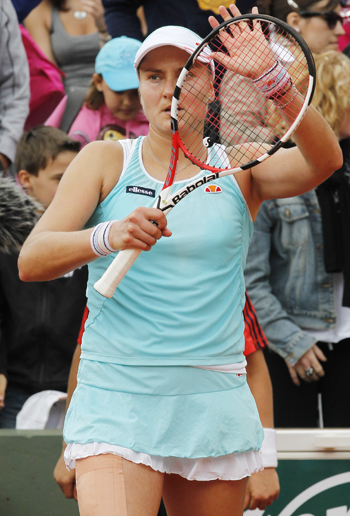 Nadia Petrova also advanced to the third round. The 19th seed from Russia scored a comfortable 6-1, 6-2 win over Hungary's Agnes Szavay. Petrova, 27, a semi-finalist at Roland Garros in 2003 and 2005, is regaining her best form after a slump. She made it to the last eight of the Madid Open beating Serena Williams en route. Agnes Szavay has flattered to deceive after showing early promise. The 21-year-old Hungarian, after being named the WTA Newcomer of the Year in 2007 and achieved her career high ranking of World No. 13 on April 14, 2008, has gone downhill since. Dane Caroline Wozniacki eased into the third round of the French Open with a 6-3, 6-1 victory over Italy's Tathiana Garbin on Wednesday. Third seed Wozniacki was rarely troubled on Court Suzanne Lenglen by the World No 56 and relied on her forehand to break five times in a one-sided contest. She wrapped up the win after 68 minutes when Garbin fired a forehand long. Wozniacki will next face Romanian 31st seed Alexandra Dulgheru for a place in the fourth round. Jo-Wilfried Tsonga urged French Open organisers to extend him the same kind of courtesy granted to Britain's Andy Murray at Wimbledon after his preparations were upset by unexpectedly playing a day early. 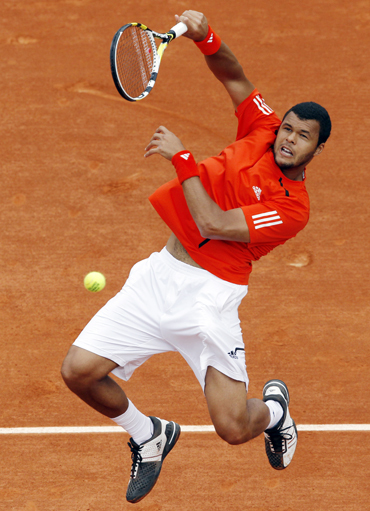 Tsonga, seeded eighth in Paris, asked organisers if he could start his Roland Garros campaign either on Monday or Tuesday but his request was turned down and the burly right-hander made his bow on Sunday's low-key opening day programme. "We are in France. I'm French. I'm French number one. I would have thought it was legitimate for me to be listened to, that I would be given a choice. They should listen to me when I wanted to play or start," Tsonga told reporters after his 6-0, 6-1, 6-4 second-round win over compatriot Josselin Ouanna on Wednesday. "I had asked not to play on a Sunday because I had practised in such a way that I thought I wanted to play on a Monday or Tuesday, to be totally fit. "But they imposed it on me. If you're world No. 80 and you're not that important in the hierarchy, if I can say, loads of things are imposed on you in this case. "What really bothered me is that, you know, if you look at (Andy) Murray, if he decides on a day or hour at Wimbledon, nobody is going to impose anything on him." Fellow Frenchman Richard Gasquet also had his request to play on Monday or Tuesday denied by organisers and played his first-round match against Briton Murray just two days after beating Fernando Verdasco in the Nice Open final. "24 hours (of recuperation), it's important. It would have made a difference but I knew I could play either on Monday or Tuesday," said Gasquet. "For Federer in his country it's the same," he said. "In the U.S. I suppose it's the same thing for the best American players." "I expected a bit more from the organisers." Reigning champion Svetlana Kuznetsova accused the new generation of players of not showing enough respect on Wednesday after narrowly avoiding an early exit from the French Open. The Russian sixth seed held on by her fingernails against 22-year-old German Andrea Petkovic, saving four match points before claiming a 4-6, 7-5, 6-4 victory on Court One. Afterwards the 24-year-old double Grand Slam champion took a swipe at the teenagers trying to dislodge the likes of herself, the Williams sisters and Kim Clijsters in the rankings. "You know what I think?" 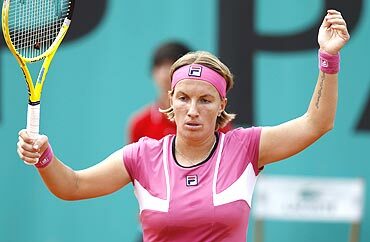 Kuznetsova said when asked why only one teenager was ranked in the world's top 25. "All the teenagers, they come or their parents or their agents or someone or they think they're so good. "I don't see them respecting the other players like we did when we came here. "I was respecting - I played Kim Clijsters. For me, it was huge. I played Justine Henin, and you're like wow! They're big. You have respect. You want to be like them. "(They) come and they see themselves equal and it's not like that, you know. These girls have done so much for tennis. "Also I don't see them physically and mentally as prepared." Kuznetsova battled grimly to turn around the match against Petkovic when all seemed lost with the German serving at 5-4, 40-0 having won the first set. Petkovic suddenly went to pieces on the match points and a relieved Kuznetsova scraped into the third round where she faces fellow Russian Maria Kirilenko. "At 40-0 down I was thinking, I really want to be here. This is really what I want most. The one thing in the world I want is to be here right now," she said. "I saw that she got tight and then I thought, okay, I have to take my chances." Kuznetsova also wobbled serving at 5-3 in the decider as Petkovic broke back but she sealed victory on her fourth match point in the next game when her opponent drilled a backhand over the baseline.